In a troubled empire, between the island of Taishu and the mainland, a dragon sleeps beneath the sea. Feared by those who know the waters, she is held captive through the magic and craft and determination of a sect of blacksmith monks who dwell on a small islet in the sea lanes. But events are in motion that may release the dragon from her long duress. A fisherman finds himself rescuing the young emperor, who is in flight from a rebellion, and his granddaughter finds herself transformed from fisher-girl to concubine and political player. A scribe's boy falls into the hands of pirates and ends up wrapped in—and responsible for—the dragon's chains. Another boy, born to life as a jade miner, finds himself first a slave, then an addict, and then the emperor's mirror. The world in which all of them find themselves is as shifting, as dangerous, and as unpredictable as the dragon herself. 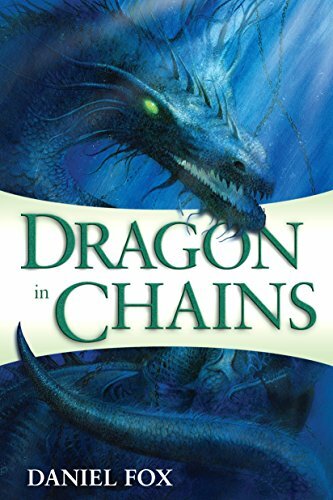 Densely plotted and lushly written, Dragon in Chains draws the reader into a world that is at once magical and real, familiar and strange, engaging and terrifying. In 2003, Fox was invited to Taiwan specifically to write about the country: this book has its roots in that experience, though there are no direct parallels with the history of our Taiwan. He started to learn Chinese and conducted considerable further research before embarking on Dragon , which can be seen, for instance, in details about court protocol, army structure, and the hierarchical relations obtaining between different levels of society. But unlike, say, Barry Hughart's Bridge of Birds , this is not intended to be a Chinese fantasy per se, and Fox is at pains to stress the fantastical elements of his story. Hence the young emperor, like the Last Emperor Pu-Yi, is under the control of his mother and her minister, but he is not Pu-Yi; indeed in some ways he is not entirely human—or at least not normally human. The chains that bind the dragon are both physical and magical, as slave boy Han learns. Words—inscribed on chains, tattooed onto flesh—have powers beyond the usual. This is a rich, textured world and—as far I can tell, at least—the Chinese material has been treated with mindfulness and respect. The themes to the fore are those of invasion and occupation, of servitude and forced labour, of social upheaval and rebellion. Each of the characters is constrained and controlled—the young emperor by the expectations and ambitions of his court, the fisher-girl Mei Feng by her class and status, the scribe's boy Han by the chains that bind him to the dragon; the effect is claustrophobic and menacing. Fox presents us with the difficulties and terrors faced by the powerless and the obscure in the face of the powerful, who see them as at best resources and more often simply as irrelevant. There is no safety in this world, and no bond is so strong as to be able to withstand the greed of others. It is significant in this context that the bulk of the cast are young adults, who must live in the circumstances their elders create. Beyond this, many of the characters are enslaved or bound—literally in the case of Han and the jade miner Yu Shan, more subtly in that of the emperor and Mei Feng. The adults are, by and large, little better off—the old fisherman Yen is rewarded for his rescue of the emperor by having his boat and labour reassigned without his consent to serve the imperial court and his granddaughter taken from him. The set pieces—from the great forge where the monks bind the dragon to a haunting evocation of the sack of a city—are vivid, painful, grim. "She saw every man die below her, and the older women too. The younger women not, or not yet" (p.118). The writing is both brutal and beautiful: "This was no fine glimmer of forge smoke. Rather it was a greasy black pillar that overhung the island like a tree's canopy, only nothing so sweet and hopeful" (p.153). There are unevennesses. Fox has a trick of writing as if his words were a film camera closing in: "What he saw, what Han saw: they saw a dragon" (p.14). This is lovely, but hard to picture and harder to read: it stutters on the eye and slows the reader. The youthfulness of the cast adds to the atmosphere of disempowerment, but I found myself sometimes longing for an older, perhaps more nuanced viewpoint of someone who is not always learning. Sometimes relationships feel a little easy; we are told, for instance, that Han considers himself bound to the slave-blacksmith Suo-Lung, but we see few of their interactions and the sense of its importance is thereby weakened. Indeed, for a slave, Han seems curiously ready to confer his loyalties—to the ship Shalla ¸ to Suo-Long, to the girl Tien—and I occasionally wanted to shake him for his acceptingness. The latter is part of his enslavement, perhaps, but it can sometimes to be hard to distinguish from naivety. Similarly, Mei Feng is happy to love the emperor who has taken her—without her consent or knowledge—from her grandfather and all that is familiar; I might have expected her to find her transition more challenging. And I do hate the title, which seems to me to belong to a far more facile, superficial, by-numbers book. But these are not book-breaking problems: they are, rather, small flaws in an accomplished tapestry. Dragon in Chains is a strong book, rich, political, thoughtful, and challenging. Kari Sperring is the author of Living with Ghosts , due from DAW books in March 2009, and is the reviews editor for Vector , the critical journal of the British Science Fiction Association. As Kari Maund, she is an historian of Britain in the early middle ages and has published five books and many articles in that field. With Phil Nanson, she is co-author of The Four Musketeers: The True Story of d'Artagnan, Porthos, Aramis and Athos . She lives and works in Cambridge, England.